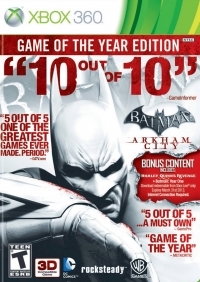 Description: The Game of the Year Edition of Batman: Arkham City packages new gameplay content, seven maps, three playable characters, and 12 skins beyond the original retail release. Also included is the exciting epilogue, Harley Quinnâ€™s Revenge â€” in this mission, players are sent back into Arkham City to face their final challenge as they interchange between playing as both Batman and Robin. Utilize each of the charactersâ€™ unique combat and investigative skills to uncover Harleyâ€™s vengeful plan and shut the gates on the urban mega-prison forever. In addition to experiencing a new storyline, fans can explore new environments and face-off against Harleyâ€™s all new gang of thugs. Box Text: Batman: Arkham City builds upon the intense, atmospheric foundation of Batman: Arkham Asylum, sending players soaring into Arkham City, the new maximum security home for all of Gotham City's thugs, gangsters and insane criminal masterminds. 11-19-2013 Damnz91 Box Text Batman: Arkham City builds upon the intense, atmospheric foundation of Batman: Arkham Asylum, sending players soaring into Arkham City, the new maximum security home for all of Gotham City's thugs, gangsters and insane criminal masterminds. Set inside the heavily fortified walls of a sprawling district in the heart of Gotham City, this highly anticipated sequel introduces a brand-new story that draws together a new all-star cast of classic characters and murderous villains from the Batman universe, as well as a vast range of new and enhanced gameplay features to deliver the ultimate experience as the Dark Knight.